Chicken is one of our most popular dishes, and with its crispy skin and soft juicy meat, it's no wonder a whole bird makes an excellent roast. Follow our top tips and cooking advice on how to achieve the ultimate roast chicken. Whether you choose a standard chicken, free range or organic is a matter of personal choice, but if possible, go for the best you can afford. Chickens are available in small, medium and large sizes. A small chicken will weigh approximately 1.2kg and will feed 2-3 people. A medium chicken weighs approximately 1.75kg and will feed 3-4 people, and a large chicken weighs approximately 2kg and will feed 4-6 people. It’s a good idea to cook a slightly bigger bird than you need, as leftover chicken can be made into all sorts of dishes during the week. Take your chicken out of the fridge 30 minutes before cooking, so it can reach room temperature and cook more evenly. Leave it covered in a cool place. Most chickens come without any giblets, but if you do have them, remove them before cooking. Use giblets to make stock or gravy, but don’t add the liver as it can impart a bitter taste. 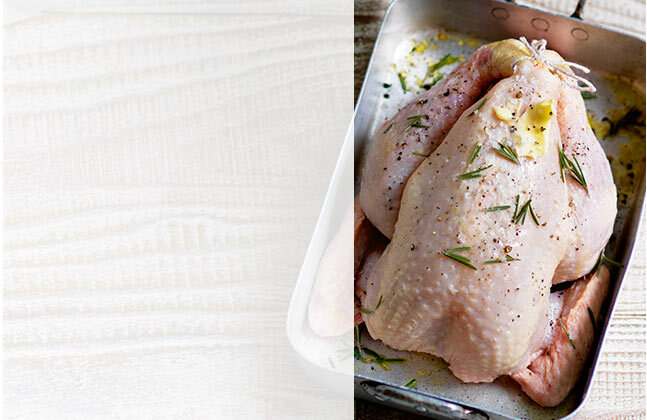 Raw chicken should never be washed - it contains a bacteria called Campylobacter that can be splashed around. Campylobacter is killed when chicken is cooked to the correct temperature. Pat your chicken dry with kitchen towel, and untie any strings so that the heat can circulate more evenly whilst it’s cooking. Preheat your oven to 200C/Gas 6/fan 180C. Rub the skin on the legs and breast of the chicken with olive oil, or smear with softened butter. Sprinkle the chicken liberally with salt and freshly ground black pepper. This will not only add flavour, but the salt will help achieve a crispy skin. Push a halved lemon and a few sprigs of herbs into the cavity – parsley, thyme and bay leaves all give chicken a good flavour. If you want to add a stuffing to your chicken, stuff the neck end, not the cavity. Push your fingers between the skin and the flesh to loosen it a little so that you can get a good amount of stuffing in. Smooth the skin back over the top and secure it with a cocktail stick underneath. A simple lemon and thyme breadcrumb stuffing is lovely in the summer months, or try a more robust pork and nut stuffing in the winter. Weigh your chicken and calculate the cooking time according to the guide below. Sit the bird in a roasting tin slightly larger than the chicken, and don’t cover it with foil or you won’t achieve a crisp skin. Basting your chicken during cooking will help keep the meat moist. Tilt the tin slightly and use a spoon or turkey baster to scoop up some of the fat, and then drizzle it carefully over the chicken. Baste 2 or 3 times during cooking. Chicken must be thoroughly cooked before serving, with no pink meat. Pierce the thickest part of the thigh with a skewer and let the juices run out. If they are clear, then it’s cooked, but if they still look pink, return it to the oven for 15 minutes, then test again. If you have a meat thermometer, push the probe into the thickest part of the thigh. The temperature should be 75C for cooked chicken. Chicken needs to rest after cooking in the same way as beef, lamb and pork, to allow the juices to settle back into the meat. Cover your chicken with foil and set aside for 10-15 minutes. This will give you chance to make the gravy. Carving a chicken is fairly straightforward when using a sharp carving knife and carving fork. Use the fork to keep the chicken steady while you carve and insert the knife between the leg and body of the bird. Remove the thigh and drumstick in one piece. Repeat with the other leg, and then separate the thigh and drumstick if you wish. Remove the wingtips, then just slice the breast meat. Silvana Franco shows you the easiest way to carve a roast chicken. Classic flavours of citrus and apple with a creamy overlay make this white Burgundy a superb match to roast chicken.